In his televised response to President Obama's State of the Union address, House Budget Committee Chairman Paul Ryan (R-WI) repeated a series of debunked Republican talking points and attacks on Democratic policies. 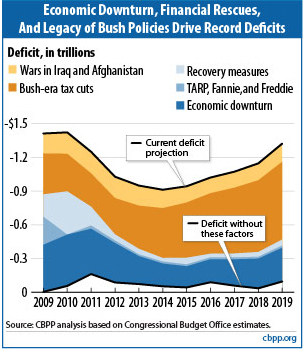 Among other things, Ryan absurdly claimed that the Recovery Act "failed" to create jobs, overstated Obama's role in creating the current debt, and stubbornly insisted that the Affordable Care Act will increase the deficit, even though nonpartisan experts say that he's wrong. Ryan: The Stimulus Failed, And Increased Government Spending By 84 Percent! RYAN: The facts are clear: Since taking office, President Obama has signed into law spending increases of nearly 25% for domestic government agencies - an 84% increase when you include the failed stimulus. All of this new government spending was sold as 'investment.' Yet after two years, the unemployment rate remains above 9% and government has added over $3 trillion to our debt. Outside experts that PolitiFact Wisconsin spoke with quibble a bit about the annual budget figures Ryan uses, but the numbers are not really in dispute. 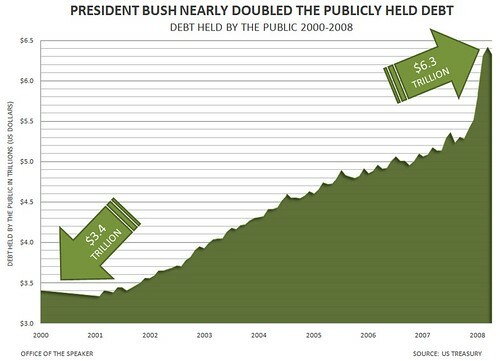 And they do show a big jump -- from $434 billion in 2008 to $537 billion in 2010. But that's a 24 percent increase, not the 84 percent claimed by Ryan and his colleagues. Is someone's math fuzzy? Let's dig in to find out. Ryan's calculations also include another number -- the discretionary spending portion of the American Recovery and Reinvestment Act, better known as the economic stimulus package. That adds another $259 million to the total, which brings it to $797 billion (with rounding) and the 84 percent. The stimulus package was approved in February 2009. Ryan includes it in the 2010 totals, so the two-year trend under Obama looks like a rocket headed straight up. In illustrating his point about spending increases under President Obama, Ryan says non-defense discretionary spending has risen 84 percent. 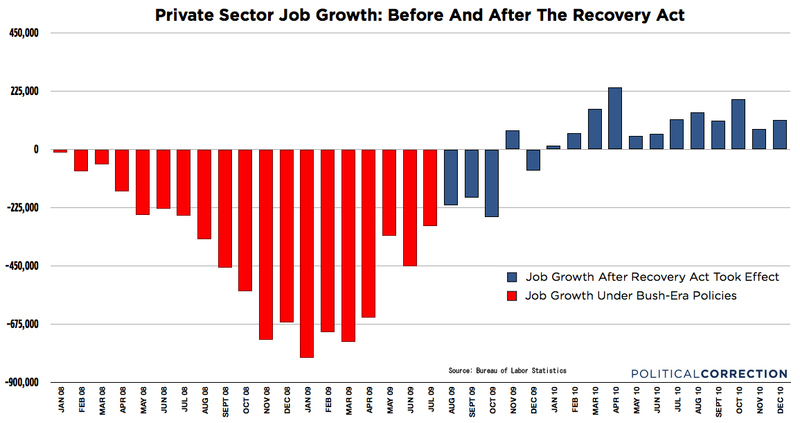 There is no doubt that spending is up, or that the one-time stimulus package was a major driver. 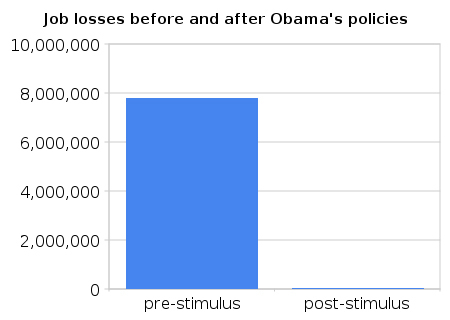 But sliding the stimulus money from 2009 to 2010 -- whether on a chart or in an interview -- skews the picture. 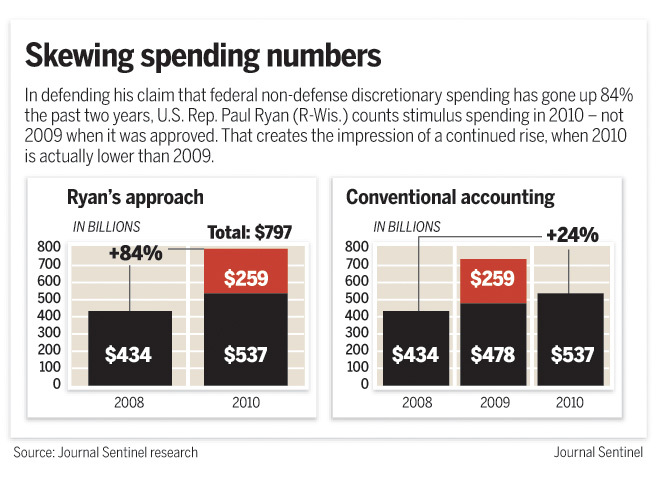 The Milwaukee Journal Sentinel produced a graphic demonstrating the difference between Rep. Ryan's methodology and "conventional accounting." RYAN: Whether sold as 'stimulus' or repackaged as 'investment,' their actions show they want a federal government that controls too much; taxes too much; and spends too much in order to do too much. We were intrigued by the claim that Democrats passed 25 tax cuts last year, so we contacted the White House press office and asked for a list. And they gave us one, all from the economic stimulus package championed by Obama and signed on Feb. 17, 2009. Each of the tax provisions in the stimulus could have been broken into separate bills, said Bob Williams, also of the Tax Policy Center, and on their own could have rightly been billed as separate tax cuts. "They packed an awful lot into that bill," Williams said. "I think it's fair to say that various tax provisions in the stimulus could be considered tax cuts. I don't think that's being deceptive." 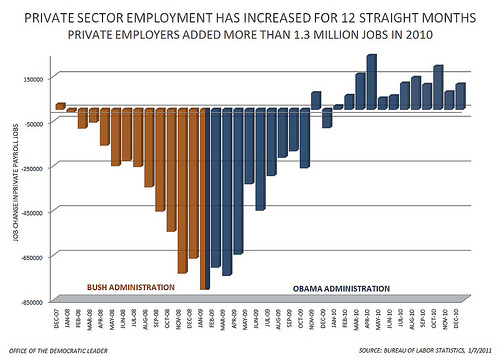 But there's one other element of Axelrod's claim, that the tax cuts were passed without the help of Republicans. The stimulus passed the House with nary a Republican vote. And it passed the Senate with just three (though we note that one of them, Arlen Specter of Pennsylvania, is now a Democrat). RYAN: Whether sold as 'stimulus' or repackaged as 'investment,' their actions show they want a federal government that controls too much; taxes too much; and spends too much in order to do too much. And during the last two years, that is exactly what we have gotten - along with record deficits and debt - to the point where the President is now urging Congress to increase the debt limit. We believe the days of business as usual must come to an end. We hold to a couple of simple convictions: Endless borrowing is not a strategy; spending cuts have to come first. RYAN: Health care spending is driving the explosive growth of our debt. And the President's law is accelerating our country toward bankruptcy. What you're seeing here isn't the cost curve bending up. It's a one-time increase in the level of spending. That's the big jump in 2014, the year the exchanges and subsidies come online. So when you compare 2014 to 2013, spending growth seems like it's gone up a bunch. But by 2016, we're back to normal. In fact, we're better than normal [according to a September CMS report]: "For 2015-19, national health spending is now projected to increase 6.7 percent per year, on average -- slightly less than the 6.8 percent average annual growth rate projected in February 2010." For a more detailed look at Rep. Ryan's erroneous debt analysis of the Affordable Care Act, read our comprehensive fact check. RYAN: What we already know about the President's health care law is this: Costs are going up, premiums are rising, and millions of people will lose the coverage they currently have. Job creation is being stifled by all of its taxes, penalties, mandates and fees. 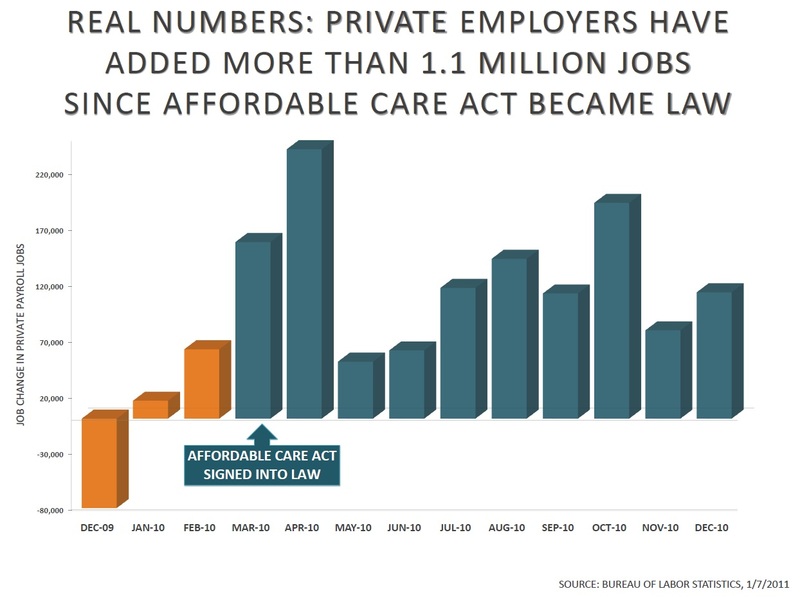 Minority Leader Pelosi's office prepared a graph showing job gains and losses per month since the Affordable Care Act passed.